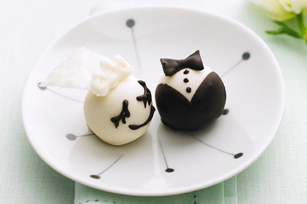 I give you Bride and Groom OREO Cookie Balls. Are they not super cute? And since they’re made out of OREO cookies they are bound to be delicious too! Now I’m sure you thinking “what bride has time to make her own favors?” Well, none probably. But brides have a gaggle of bridesmaids and aunts and maybe even uncles who love to cook. And these are a no-bake cookie so they can’t be that difficult. The recipe makes 48 cookie balls (so 24 brides and 24 grooms) which means it’ll have to be doubled, tripled, quadrupled (or more) for bigger weddings. These would be ideal for a couple who is hosting a smaller reception or if you’re trying to stick within a tight budget and you don’t want to order favors. Plus, everyone loves OREO cookies. You can find this super easy and super fun recipe here. It even gives directions on how to create a bridal veil out of white chocolate!